Gimme My Reality Show! premiered on FRC on October 12, 2008. In this series celebrities compete for the right to have their own reality show. 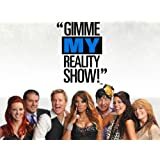 It allows previous supporting reality stars the chance to compete for extra time in the spotlight and for something they've haven't had - their OWN reality show.